28:06:42:12…that is when the world will end. As promised, a pattern release! You can download it now on Ravelry. I will admit to being rather excited, as it’s the first pattern work I’ve done in quite a long time. It felt good to dig into page layout again, though next time I don’t think I’ll give myself such a tight deadline. "Why do you wear that stupid bunny suit?" 28:06:42:12 is inspired by the movie Donnie Darko, and features evil bunny rabbit motifs as well as the distinctive countdown to the end of the world. I recommend watching the movie, listening to all the old 80’s tunes that I remember with fond nostalgia, and settling in with a good sock. As previously mentioned, 28:06:42:12 will be available free for a full year, then will be available for a reasonable price afterwards. 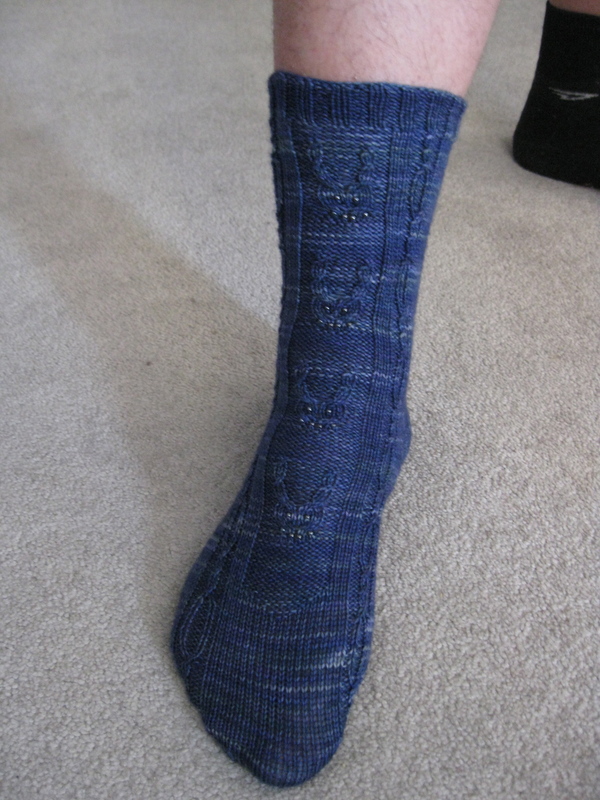 It is also this month’s Skinflint Sock Club pattern for those who might be following along. 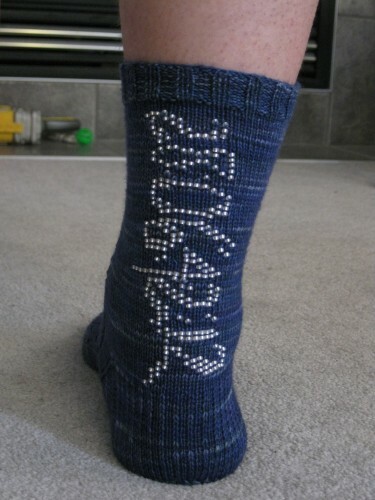 I thought it might be suitable for this month’s Sock Knitter’s Anonymous KAL on Ravelry, but I was mistaken. Whoops. As always, if you see any errors in the pattern, please let me know in the comments (either here or on Ravelry) so that I can correct them! Many thanks to Robin for being my model for the last-minute “hooray, I finished the first one!” photo shoot! Update: For those who are a little leery of doing so much beadwork, and have no idea how to get the beads on the sock, check out this youtube video (no, not made by me. It just explains things nicely). Easysauce! Plus 25% more added cuteness.